Darwin was right. Survival of the fittest is the mantra of every living organism and that includes business. It is especially true in franchising where fresh new operators jump into open waters under the watchful gaze of the franchisor. Awash in the blissful wave that is the Franchise Agreement, franchisees feel safe that someone will rescue them if something goes wrong. This is where Darwin’s theory smacks them upside the head with a thud. The problem is that safe in business is not a reality you will find. Did you ever think that some of the big-box retailers would go out of business? Of course not. Were you thinking bigger is safer? That’s wrong and so is buying a franchise and thinking you are safe. Want to be safe in business? You have to work for safety. There is risk in everything and the quicker you realize how fast things can turn upside down, then better your business will be. The only constant in life is CHANGE. 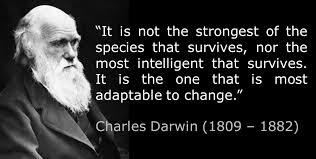 Darwin knew that and he applied it to animals. I know it and I see it every day in business. You may notice that no where on that list is there a parachute with the franchisor’s name on it. That’s because you bought the right to use a system, not the right to be saved from failure. Now do not get me and the team at Business Bulldog wrong, the franchisor wants you to succeed. They make more money when you make more money and they get to survive another day right along side of you. Some franchises though are not set up for rescue missions. We have worked with plenty of them and cried with the families who lost everything. Jumping back a couple of paragraphs, I mentioned that you can work for safety in business. Here is the secret to that safety in a franchise…follow the system. Sound simple? The franchisor has already lost a ton of money on how to do things wrong. If it is a good franchise, it will change over time to meet the new needs of customers. Follow the system and be prepared to follow the three steps above. Focus on what will strengthen what you already have and your business will live another day. How dare I say that some of you won’t make it in a franchise? That seems to be the million dollar question. That is, a million dollars you can earn or lose. I would rather tell someone they aren’t ready to be in a franchise than let them flop around like a fish out of water with the hope they learn to breathe. Darwin had it right. There are groups of people who make it and thrive and there are groups that disappear. The world of business is ugly and does care if you really, really want to be a business owner. Failure happens more often than success. It has always been that way and it always will be. Franchising is best suited for a follower/ leader – yes, that is the same person. Is that you?